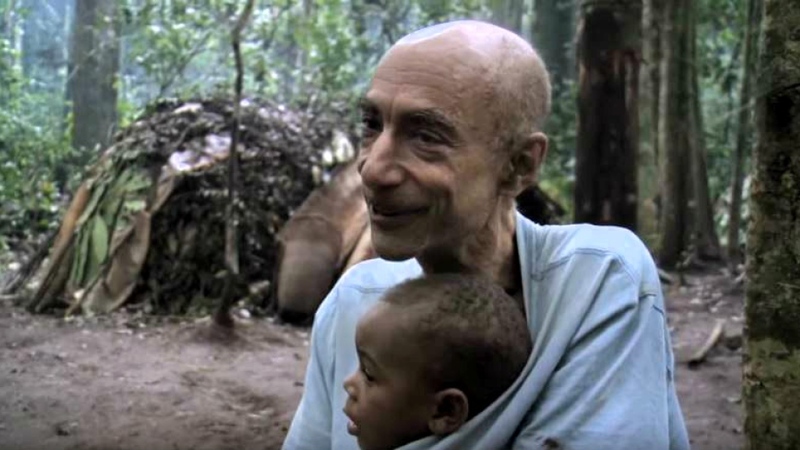 Louis Sarno, an American original who lived for 30 years among Bayaka Pygmies in the Central African rainforest and recorded their polyphonic music more completely than any audio adventurer or ethnomusicologist could dream of, died where he was born, in New Jersey, on April 1, 2017. He was just 62, but withered from bouts with malaria, leprosy and cirrhosis resulting from hepatitis B. 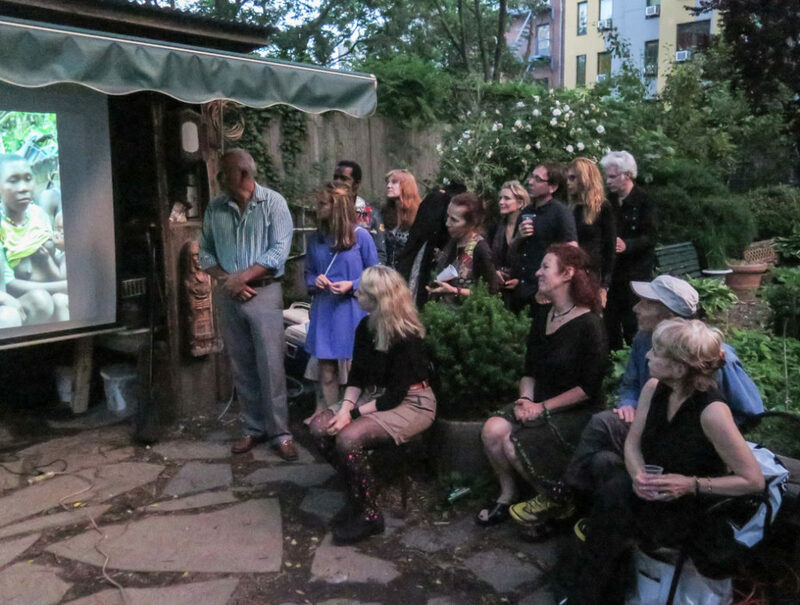 In May, a group of his family and friends gathered in a garden in New York’s East Village to eat, drink, listen to the beautifully mysterious music that shaped his life, and remember Louis. His brother Steve, whose American life hardly could have been more different, spoke of how much he learned from Louis and what a powerful example he was of living life to the fullest. 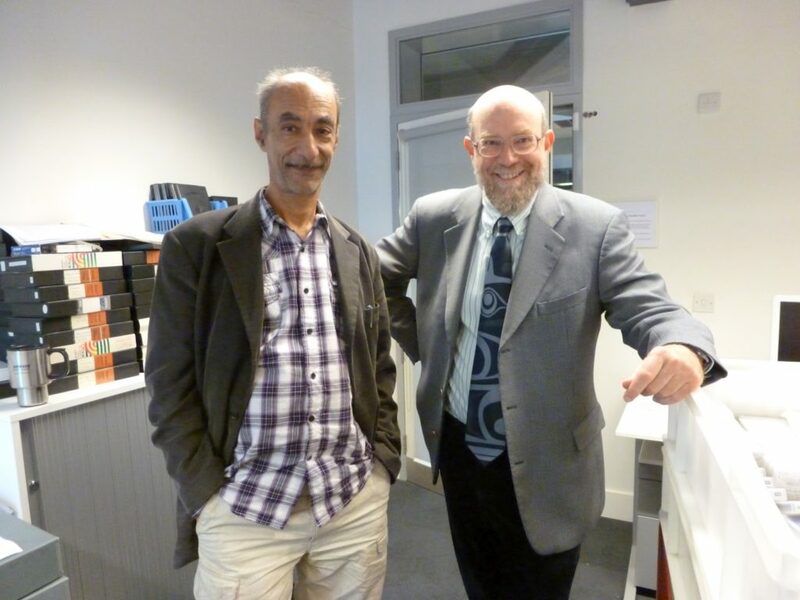 Noel Lobley of the Pitt Rivers Museum (University of Oxford) recalled the delight of working with Louis to curate the massive collection of recordings and images he left to the museum in 2013. Filmmaker Jim Jarmusch, a close friend since college days, spoke about how he and Louis could make each other laugh so long and hard that they were literally in pain. And many friends and associates remarked at Louis’s remarkable capacity to keep up with news and pop culture while living in one of the most remote corners of the world. Jarmusch said he often kidded Louis, saying that he really never went to Central Africa at all; but rather holed up somewhere soaking in the world and inventing wild stories to tell his friends. One family member noted that Louis knew well that the life he had chosen would not deliver him to a ripe old age. The risks and inevitable exposure to health hazards were simply too great. But Louis had no regrets. I met Louis just once when he visited New York City about four years ago. He knew our program, including the fact that the first recording he had ever heard of Pygmy vocal music was on a broadcast hosted by our own Georges Collinet. 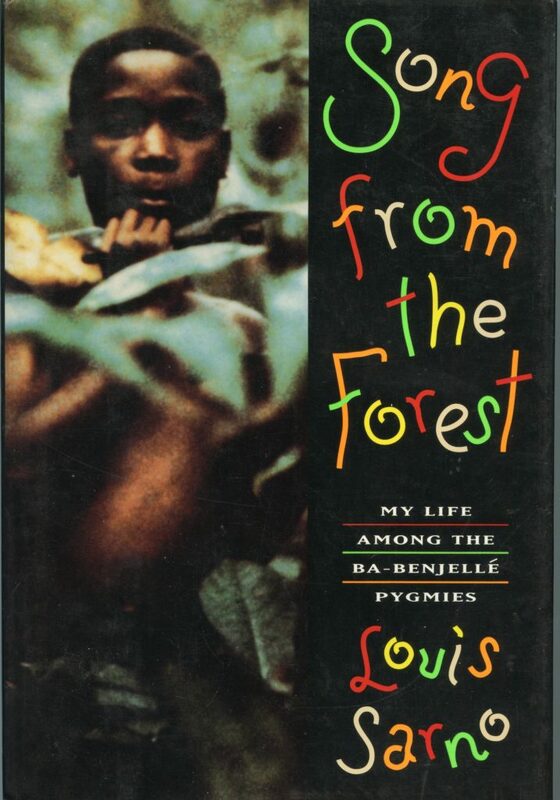 (This was before Afropop Worldwide existed, and the story is complicated by the statement in Louis’s memoir, Song From the Forest, that the music was back-announced in Flemish. As best we know, Georges does not speak Flemish. Still sorting that one out…) We drank tea, talked music and politics and goings-on in the Central African Republic, then enduring brutal violence at the hands of Muslim mercenaries. I too was impressed by how connected Louis seemed to so many things despite his radically remote life. I was also struck by his calm, nonplussed manner. He seemed a man troubled by the world but deeply at peace with his place in it. Some 20 years before we met, I reviewed Louis’s memoir for the Boston Phoenix. At the time, I had not embarked on my own extended adventures in Mali and Zimbabwe, but when I did, I always held his story in mind. I still consider it the gold standard for total immersion in another culture, and sacrificing all in the name of a passion, one that began with music but extended to all aspects of humanity. Over the years, Louis became a kind of reluctant guardian for the Bayaka, their doctor, their advocate, their defender and a man who struggled against all odds in what he knew was an ultimately doomed effort to defend them against the destructive forces of modernity. Louis’s recorded legacy will live on as an unrivaled record of a vanishing music culture. And his efforts on the behalf of the Bayaka survive him. 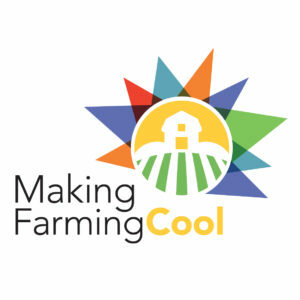 Among his final wishes was to encourage his admirers and friends to donate to an organization he completely trusted to work solely on their behalf. For more on that, visit Global Voices (www.globalvoice.ws/louis-sarno). Louis’s death inspired me to find that review I wrote of his book back in 1994. So here it is, unedited and unchanged. Count me among those who will always take profound inspiration from this singular man. He immediately plunged himself into research, digging up every recording that existed of Pygmy music from Zaire, Cameroon, Gabon, and the Central African Republic. 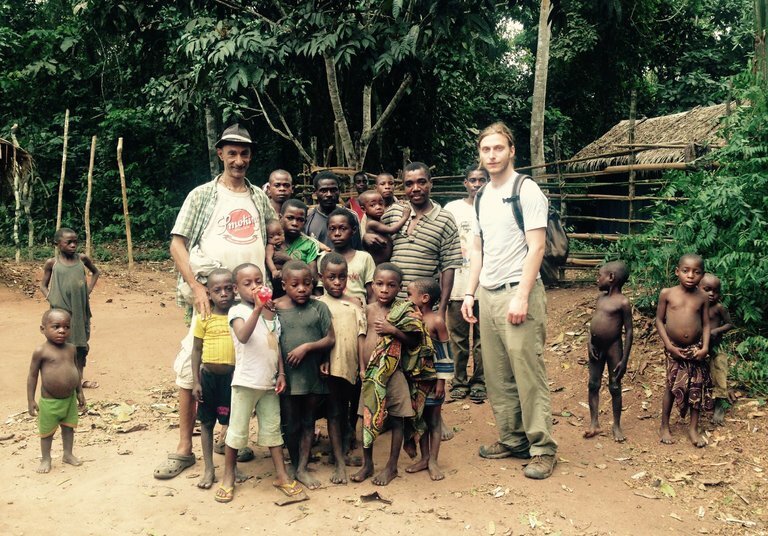 He corresponded with the people who had made those recordings, notably Colin Turnbull, who recorded the Mbuti Pygmies of the Ituri Rainforest for the Smithsonian Folkways collection during the 1950s, and wrote the classic ethnography, The Forest People. With Turnbull’s encouragement, an all-consuming curiosity, and a one-way plane ticket to Bangui, capital of the Central African Republic, Sarno set off in search of the most remote and least researched group of Pygmies he could possibly find. Sarno tells the story of the Everyman turned eccentric. He seems so normal, except for the obsession that took him from the comfort of home to the forest’s edge. It’s easy to fall in step behind him as he slowly sheds his preconceived notions, which he describes with disarming candor. “What dismayed me most about the Pygmies,” he writes, “--in particular the men, since my interaction with the women was still minimal--was how contemporary, even hip, they seemed. I found it hard to reconcile the people before me with the image I had held of hunter-gatherers, whose every gesture, I had imagined, would be full of ritual significance, every utterance full of wisdom. I noticed no ritual at Amopolo, and its absence prejudiced me against the Pygmies, as if it were their fault for losing it. It had not yet occurred to me that their rituals might be so well integrated into the daily routine that they would escape my notice. Sarno’s first attempts at recording prove equally frustrating, and present the classic tale of the disoriented visitor, trying to get the real stuff, never sure whether his subjects are holding out on him or whether he’s just in too much of a hurry. At first, the Bayaka give him a tourist display--sloppy renditions of only their most superficial music. Enraged by such treatment, Sarno eventually erupts in anger, refusing to record and even insulting their lackluster offerings. The outburst works, earning him a modicum of respect, and more importantly, deepening glimpses of the Pygmys’ abundant musical palette. After three months, Sarno has given away or been conned out of everything he has brought with him. Having spent all his money buying cigarettes, clothing, tools, alcohol and marijuana for his new friends, and having gone through all the batteries he brought for his tape recorder, Sarno finds himself with no possibilities and no plan. But his fascination is undiminished. It takes a severe bout of malaria to actually make him leave, which he does with the help of charitable Yugoslavians at the sawmill. More than two years later, Sarno returns to Amopolo with modest assignments to record music for Dutch radio and for a Brian Eno project involving “forest sounds and ambient music.” Now somewhat clearer about his mission, Sarno consciously rejects the advice of Simha Arom, a famed field recorder. Arom believes in creating special sessions where musicians play pieces that he has preselected. 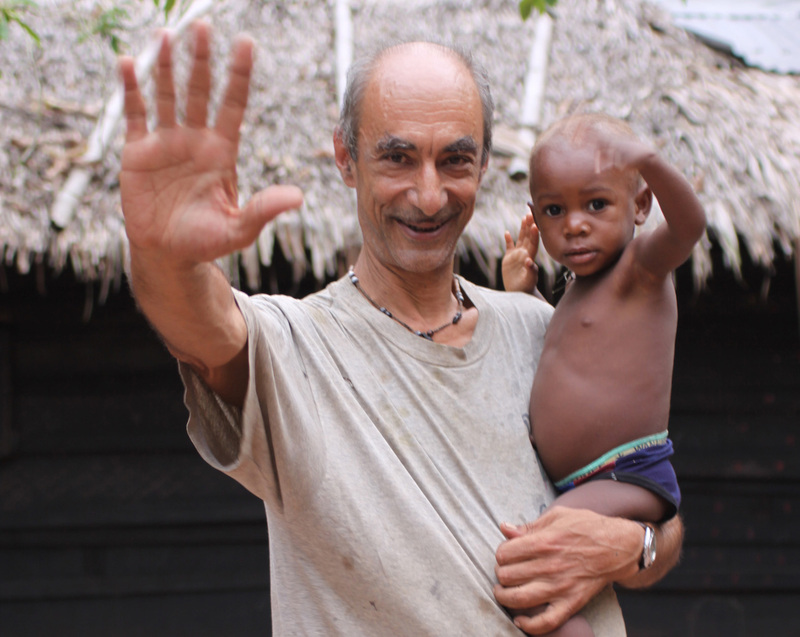 “The more I thought about Arom’s method, the more convinced I became that my search was different,” writes Sarno, “It was not just the music I was after; I wanted to record how life really sounded among the Bayaka when no outsiders were present.” This meant making himself an insider, a task most field recorders would recoil from instinctively. Sarno’s book includes lots of information about the Bayaka’s music and its role in their lives. He conveys the moods of elanda, the rowdy teenagers’ dance, eboka, the drum dance, elelo, the lament for the dead, mbola, the men’s circle dance, and especially lingokoo, the transcendent, cooing women’s singing associated with marriage. He discusses the local instruments, notably the mondume harp, the geendal zither, and the deeply booming earth bow. Most powerful of all are his descriptions of dances by the mokoondi, or forest spirits. These raffia-clad, sometimes phosphorescent dancers inhabit the Bayaka’s physical and psychic universe. Some mokoondi, such as Ejengi, can visit the encampment for weeks at a time, lurking at the outskirts, or boldly entering the compound to spin and whirl in response to the music, evoking fear and wonder, and attracting many visitors from the nearby village of Bomandjombo. The Bayaka's complex relationship with these more urbane villagers--both a source of supplies and of exploitative and manipulating officialdom--makes great reading. Well aware that his presence necessarily involves interfering with the Bayaka, Sarno consciously attempts to counterbalance his influence with what he sees as the villagers’ more malevolent tampering. Deploring the alcoholic binges that contact with villagers facilitate, Sarno is happiest when the Bayaka move their camp deep into the forest for extended hunting expeditions. There, life and music come into sharper focus. A story like this can’t help but add to the romanticization of these fabled forest denizens, especially when Sarno reveals them in their deep forest mode. 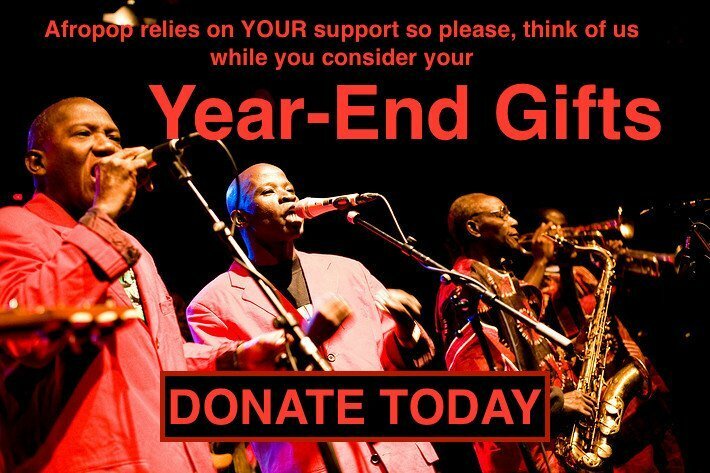 The Pygmies may have been the first inhabitants of Africa, and their ancient songs convey a profound sense of timelessness--the very morning of the world’s musical culture. But alongside compelling amateur ethnography, Sarno tells an unsettling personal story that becomes more and more dominant as the book progresses. Two obsessions rise to overwhelm the musical quest that begins his narrative. First is Sarno’s fear of bees, which exist in variety and abundance in the forest. Mistakenly believing that he is allergic to their stings throughout his second visit, Sarno lives with the constant sense that a moment of inattention, a single bee sting, might leave him dead on the forest floor. When, inevitably, the sting comes and Sarno survives, this obsession evaporates. But the second one, his infatuation with and ultimate marriage to the young Ngbali, remains a severe and bizarre distraction right through the end of his story. Sarno accepts the notion of this marriage--originally the Bayaka's idea--with the same sort of unquestioning leap of faith that originally brought him to Amopolo. But when his bride refuses to sleep with him, talk to him, at times even acknowledge him, Sarno descends into brutalizing fits of depression, jealousy and Proustian absorption. Sarno’s official papers qualify him only as a music researcher, but both the Bayaka and the villagers believe that his true mission is to “civilize” the Bayaka. 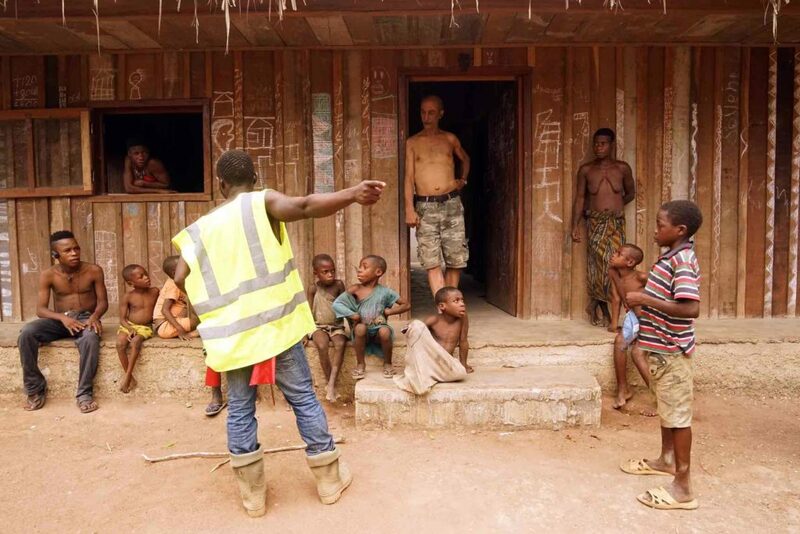 This can mean anything from buying them copious quantities of supplies in distant Bangui, to being their doctor, to intimidating village shamans--known as nga-nga dancers--who at one point try to blame Bayaka sorcerers for sabotaging the now-defunct sawmill. 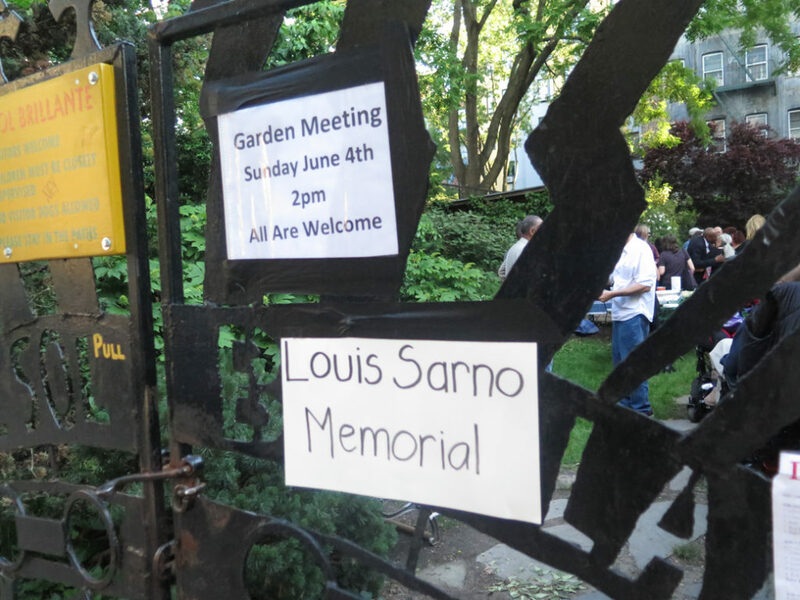 In an odd way, Sarno comes to accept this amorphous leadership role. He acknowledges its unsavory, paternalistic overtones, but as with so many things, he’s able to dismiss that sort of external judgment because his own personal reality looms larger. At the end of the book, having seen the community through a devastating malaria epidemic that claims many children and teenagers in the clan, Sarno achieves what he considers a truly positive objective, to move the clan to a new base settlement, replacing Amopolo. The new site, the Bayaka’s first to be equipped with outhouses, is also further from the mosquito-infested raffia swamp, a source of malaria, and from the corrupting proximity to villagers. In the acknowledgments that end his book, Sarno vigorously rejects any comparison between his work and anthropology. “I am the first to admit my vast ignorance regarding many aspects of [the Bayaka’s] life,” he writes. “Some passages in this book may outrage many anthropologists.” Perhaps. But in revealing himself so candidly, Sarno has created a unique work and he has mapped emotional and thematic territory that any Westerner who would immerse him or herself in a remote culture must negotiate. Sarno raises more questions than he answers, but his willingness to give himself over to the alien makes his a noteworthy case study in the literature of modern cultural explorers. “My attitude of acceptance of the forest spirits played a large role in shaping my subsequent experiences,” writes Sarno. “Unlike Alice in Through the Looking-Glass, I find that I can believe impossible things.” That should serve him well. As his narrative ends, Sarno’s wife Ngbali has yet to sleep with him.